AMGA Mountain Guide Programs train and certify working and aspiring Guides. The AMGA is the leader in Guide Training and Education and is the place to come to further your professional development as a Guide. Our programs consist of three disciplines: Rock, Alpine, and Ski. You can get certified in one, two, or all three disciplines. 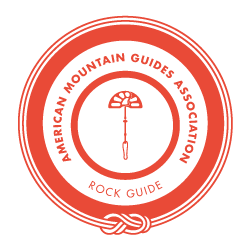 If you become certified in all three disciplines you become an American Mountain Guide/IFMGA Guide. The Rock Guide Program consists of three programs: the Rock Guide Course, the Advanced Rock Guide Course and Aspirant Exam, and the Rock Guide Exam. The Alpine Guide Program consists of four programs: the Alpine Guide Course, the Ice Instructor Course, the Advanced Alpine Guide Course and Aspirant Exam, and the Alpine Guide Exam. The Ski Guide Program consists of three programs: the Ski Guide Course, the Advanced Ski Guide Course and Aspirant Exam, and the Ski Guide Exam. If you become certified in all three disciplines, you become an American Mountain Guide/IFMGA Guide.